PolitiChicks.tv has just received confirmation that a voter in Las Vegas tried voting for Governor Mitt Romney but the machine automatically checked â€œObamaâ€� multiple times instead. â€œYesterday I went to an early voting site at Centennial Center in Las Vegas, NV. I went with my 19 year old son who was a first-time voter. I went to an open machine and inserted my card. When the selections came up, all of the candidate pairings were listed and I touched the box for Romney/Ryan. The checkmark appeared next to President Obamaâ€™s name. I touched the check mark removing it and touched the box next to Romneyâ€™s name again. Again, the checkmark appeared next to Obama. Imagine going to vote for your presidential candidate and pushing the button on a touch-screen voting machine -- but the "X" marks his opponent instead. That is what some voters in Nevada, North Carolina, Texas and Ohio have reported. Fox News has received several complaints from voters who say they voted on touch-screen voting machines -- only when they tried to select Mitt Romney, the machine indicated they had chosen President Obama. The voters in question realized the error and were able to cast ballots for their actual choice. Marion County Board of Elections Director Sophie Rogers, though, said: "My personal opinion is that she hit it too hard." "We've noticed people just punch on them. She might not have hit the square that she wanted," Rogers said. Rogers insists there are no problems with the touch-screen machines in Marion County and that after learning of Stevens' complaint she took the machine out of circulation and had it reexamined and recalibrated. She says there was nothing wrong with the machine to begin with. But in response to the growing number of complaints, the Republican National Committee has sent a letter to election officials in six states -- Ohio, Nevada, Kansas, North Carolina, Missouri and Colorado -- demanding tighter controls on touch-screen machines. The RNC wants the machines to be re-tested, more technicians added to fix any problems, and verbal reminders given by election workers telling voters to double check their ballots. Multiple voters from several states wrote Fox News to report problems similar to what Stevens reported. One voter asked: "I wonder how many voters just hit the 'Cast Ballot' without reading the machine?" "How can we be sure our votes are not being stolen electronically?" asked another. One expert warns it can happen. "Vote jumping complaints have arisen in every election that uses touch-screen voting machines, with the complaints going both ways," said Barbara Simons, author of the new book "Broken Ballots: Will Your Vote Count?" Simons, an expert on electronic voting who is on the Board of Advisors of the U.S. Election Commission, said there is good reason for people not to trust the older touch-screen machines. She said, "This phenomenon can occur when a machine goes out of calibration. The need to re-calibrate frequently is an important reason for discarding these aging, unreliable, and inaccurate machines and replacing them with paper ballots." Frequently recalibrating the machines is one of the RNC demands. But election officials insist that the machines are practically foolproof. They say any problems are due to human error, and that tinkering with machines is almost impossible. "It is nearly technically impossible to pre-program the voting machines in Nevada to vote for a specified candidate," said Nevada Secretary of State Ross Miller, in a statement to Fox News. He said machines are tested by each of the state's 17 counties individually. "While it is possible for a voter to inadvertently select a candidate, it is not possible for the machine to automatically select a candidate." Miller notes that similar allegations were investigated in his state during the 2010 election, with the assistance of the FBI. Authorities found that claims that machines "were pre-programmed, malfunctioning or in any way preventing any voter from casting a ballot for the candidate of their choice were without merit." Miller, a Democrat, brands the Republican demand to election officials as "based upon rumor, hearsay, or unconfirmed media reports," as well as "irresponsible" and "unfortunate." He said his office has "not received any direct, first-hand complaints from voters." In Ohio, touch-screen machines, for example, are being used in Lorain County with no reported "switched votes" or operational issues. 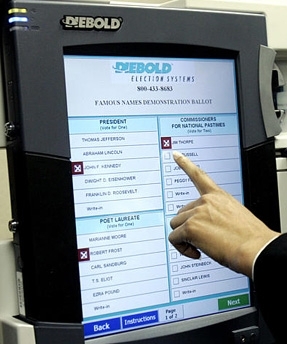 "We haven't had any problems with the touch screens this year and everything is going well," Lorain County Board of Elections Director Paul Adams told Fox News. His county has used touch-screen machines since 2005. Adams, a veteran election official, said that in his county, machines are not electronically designed to be able to change choices, and there is no way for anybody to rig a machine or pre-program its choices for one candidate or a slate. "We have heard of these issues in some of the other counties. We had sporadic issues a few years ago, and since then we have upgraded our software and our board has replaced most of our touch-screen unit screens if there were any problems with them. And since we've done that about a year and a half ago, we haven't had any major issues." Lorain County did replace 400 of its 1,200 touch screen machines last year. Adams also notes that there is what is called "a paper trial," like a receipt, where voters can see their choices printed out. He also says that anybody who has a problem voting should immediately tell elections officials. While Fox News spent the day at the County Board of Elections, where early voting was taking place, election workers were doing just that. One woman's long fingernails blocked her selection, until she moved the angle of her fingers to get it right. An elderly man did not realize that he did not cast a vote for president, so a worker did exactly what Adam advises. She walked the voter through the process. "I pushed the button!" the man declared. "You might have accidently hit it twice. Just lightly tap it, real light," advised the worker. She also showed the voter the paper evidence of his votes to confirm them. "Yes, thank you very much," the voter replied. Nevertheless, Joan, who said she finally was able to cast a correct vote after three attempts, advises fellow voters to confirm their choices. "Be very careful when you vote. I don't care who you vote for, just double-check." Voting Machines Auto-Selecting Obama; Calibration issue or are they Hacked? Numerous reports are surfacing about touch screen voting machines automatically selecting Obama, even when Mitt Romney was chosen. Even when Mitt was repeatedly pressed, the system selected Obama. Is this a touchscreen calibration issue, or could the machines have been hacked? It could be a calibration issue, â€œThis phenomenon can occur when a machine goes out of calibration. The need to re-calibrate frequently is an important reason for discarding these aging, unreliable, and inaccurate machines and replacing them with paper ballots,â€� said Barbara Simons a member of the US Election Board of Advisors. And according to reports, in one location a machine that was suspect was taken out of service and recalibrated. But with reports coming in from several states, concerning numerous machines, could something else be going on? A year ago the Vulnerability Asset Team of Argonne National Lab showed that some of the touchscreen voting devices could be hacked very easily. According to a CNNMoney report, on one model all it would take would be physical access to the system, a paper clip, and about $20 worth of electronics. And in under a minute they could have remote access to the device with the ability to change someoneâ€™s vote. Many of these machines have the ability to dump a printed copy of who was voted for, but shockingly some do not, and there is no way to physically validate the votes. Calibration issue or not, this is going to be a very close election and it does not bode well that there are already issues with the voting systems. Will the 2012 election be stolen? And if it is... can the theft be reversed? After making these promises, most of the voting machines lit up and began flashing pre-election results ranging from â€œObama 58% â€“ Romney 42%â€� to â€œObama 72% â€“ Romney 18%.â€� Some of the machines were so excited that their systems started to crash, similar to Obamaâ€™s human supporters who faint at his campaign rallies. You've got to love that email name. How about Electionfraud instead? It not only points to the real problem but it also covers voter fraud. Can't have that though. I don't know who's going to "win", but after the way Ron Paul supporters/delegates got treated at the RNC...it's not like Romney can have his cake and eat it too. And of course Bush II won Ohio(and the election) in 2004 b/c of DieBold. The only votes that will truly without a doubt be counted as voted will be third party unless it shows one might need a few of those to win. May be a good idea to write your vote on election form as well. or take a picture of the voting screen before you send it. A voting machine in Pennsylvania was â€œtaken out of serviceâ€� for flipping votes for President Barack Obama to Republican challenger Mitt Romney, MSNBC reporter Zachary Roth confirmed Tuesday afternoon. I humbly ask that you consider voting for me for this position. I would love to serve this community. Thank you for your consideration.